Jack McClure is back in the latest thriller from Eric Van Lustbader. In Last Snow, ATF agent McClure is now a special advisor to the newly elected president, his long-time friend Edward Carson. The president has asked him to look into the death of a U. S. senator, who was supposed to be on a political trip in the Ukraine, but has turned up dead on the island of Capri. McClure soon finds himself in the middle of a dangerous web of dirty politicians and criminals, where nothing is what it seems. McClure must use his unique abilities to piece together the complex puzzle and discover the truth. Complicating matters is the fact that he isn't able to work alone. Joining him on this mission are the president's daughter, Alli, and Russian agent, Annika, two strong, capable women who at once add to the danger and also prove to be invaluable to McClure's success. 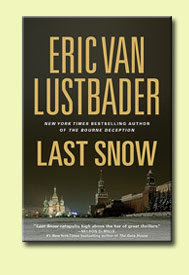 Last Snow is a very complex political thriller that will keep you guessing until the very last page. As in the first McClure novel, First Daughter, I found myself completely lost at times, unable to figure out who was working for whom and for what purpose. The lines between good guys and bad guys is obscure. But I knew Lustbader would pull it all together in the end, making everything crystal clear. All of the pieces of the puzzle were slowly revealed through to the last page. What a page-turner! I look forward to future books featuring the Jack McClure character. Click here to read an excerpt from Last Snow. This review was written based on a copy of Last Snow that I received from the publisher, Forge Books. Is your giveaway open also outside the US? I'm in the UK but I'd love to read it. All the best. Ciao. A.
love the review. My favorite genre .. . . hard to choose, but I think I definitely lean towards historical fiction. Thanks for the chance!! This looks like an awesome read.